NUSAJAYA: UEM Land Holdings Bhd is confident Nusajaya will have enough to attract investors and residents by end-2011 when major projects such as the RM1bil Kota Iskandar are completed. By then, the RM1.4bil Coastal Highway linking Danga Bay to Nusajaya and the RM715mil Legoland Theme Park would also be ready, said managing director and chief executive officer Wan Abdullah Wan Ibrahim. “Nusajaya is progressing well and has attracted interest from both local and foreign investors despite the current economic slowdown,’’ he said yesterday. He said this at a briefing attended by Housing and Local Government Minister Datuk Seri Kong Cho Ha and his deputy Datuk Seri Lajim Ukin during their working visit to Iskandar Malaysia. UEM Land is the master developer of the 9,308ha Nusajaya, which is the key driver of Iskandar Malaysia. Nusajaya comprises seven signature developments – Kota Iskandar (Johor State New Administrative Centre), Southern Industrial and Logistics Clusters, Puteri Harbour Waterfront Development, EduCity, Medical City, International Destination Resort and Residential Developments. Wan Abdullah said its high-end residential projects, East Ledang and Horizon Hills, a joint venture between UEM Land and Gamuda Bhd, had attracted a large number of foreign buyers. “Foreigners made up of 65% and 45% of the buyers at East Ledang and Horizon Hills respectively and the projects have recorded a good take-up rate,’’ he said. He said UEM Land would sign a contract with the Federal Government this year to build a housing project for the latter’s staff based in Kota Iskandar. Wan Abdullah said it would also submit a proposal to the Federal Government to build the Customs, Immigration and Quarantine complex (CIQ) at Puteri Harbour. He said the CIQ Puteri would facilitate visitors coming to Johor Baru from Singapore using water taxis and ferries from nearby islands in the Riau Archipelago such as Bintan and Batam. Wan Abdullah said the CIQ Puteri would also provide similar facilities for boaters and yachters from all over the world to moor their vessels. 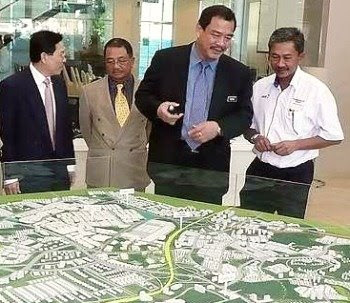 Meanwhile, Iskandar Regional Development Authority chief executive officer Harun Johari said investment in Iskandar Malaysia would be largely driven by the private sector. Of the RM47bil investment expected in Iskandar Malaysia by next year, 60% would come from the private sector while public spending and government-linked companies would make up the balance, he said. Launched on Nov 4, 2006, the 2,217-sq-km Iskandar Malaysia is divided into five flagship development zones – JB City Centre, Nusajaya, Eastern Gate Development, Western Gate Development and Senai-Skudai. UEM Land Holdings Bhd expects growth for its Nusajaya township to start gathering momentum from 2011 as more infrastructure and other projects near completion. Managing director Wan Abdullah Wan Ibrahim said the year would mark the starting point for many large-scale projects in Nusajaya. At the same time, work on other major projects would also be done by then. Among the projects that would be completed by 2011 are the coastal highway linking Johor Baru, quarters for state government staff and the federal government agency complexes. The Legoland theme park would also be in its finishing stage. "The tipping point for growth to spurt in Nusajaya would be in 2011. That is when a new pace of development begins and the environment in Nusajaya and Iskandar Malaysia would pick up pace," said Wan Abdullah during a question-and-answer session after a briefing on projects under Iskandar Malaysia. Housing and Local Government Minister Datuk Kong Ho Cha, who was on his first visit to Nusajaya with his deputy Datuk Lajim Ukin were among those at the briefing in Nusajaya, near Gelang Patah, Johor. Also present were Iskandar Regional Development Authority chief executive officer Harun Johari and Iskandar Investment Bhd managing director Arlida Ariff. Wan Abdullah said Nusajaya already has the volume in terms of residents as 11,000 houses in the township were already occupied. Foreigners also make up almost two thirds of high-end homes such as the East Ledang project. When asked about a public housing project which would cater to people working in the area, Wan Abdullah said the efforts would be made to ensure only qualified tenants would get the houses. UEM Land Holdings is the developer of Nusajaya's main features such as the state administration complexes of Kota Iskandar, Puteri Harbour, Southern Industrial and Logistics Clusters and Alfiat Healthpark and residences. OSK Investment Bank Bhd (equity capital markets) director Gan Kim Khoon said there were over RM354bil in fixed deposits and savings of individuals in the country waiting for REIT companies to tap. “They hope to channel some of these funds into REITs, which are high yielding and low risk in nature,” he told StarBiz after a one-day roadshow on REITs-Investors Outreach Programme recently. The REIT companies from Kuala Lumpur that took part in the event included Axis REIT Managers Bhd, AmFirst ARA REIT Managers and AmanahRaya-JMF Asset Management. “Outside Kuala Lumpur, REITs have little exposure from large companies, and participation by individual investors is also small,” Gan said. Meanwhile, Axis REIT Managers chief executive officer Stewart Labrooy said the company regularly implemented asset-enhancement exercises to increase the value of its assets. “Last year we injected about RM3.5mil to upgrade one of our office buildings, Wisma Kemajuan, in Petaling Jaya. After upgrading, the valuation for the property increased to RM52mil, compared with the original valuation of RM29mil in 2005,” he said. He said Axis REIT recently spent RM8mil on two of its commercial properties which were originally valued at RM106mil. “After upgrading, the valuation increased to over RM140mil. “Through such asset-enhancement exercises, we create more value-added space, which in turn attracts more tenants, and increases our income from rentals,” he said. KUALA LUMPUR: Mavtrac Sdn Bhd wants to get more involved in construction and property projects in the country after being chosen as a preferred vendor to Sime Darby Property Bhd. Chief executive officer Mohd Azman Sulaiman said the two parties last week signed a memorandum of agreement for Mavtrac to supply construction materials to Sime Darby Property’s selected projects in Malaysia and to facilitate Sime Darby Property’s spend management and strategic procurement. “Since our establishment in 2007, Mavtrac has been consistently delivering quality materials at prices competitive to the market. To date, Mavtrac has supported contractors delivering projects to an estimated development value of more than RM250mil,” he said at a media briefing yesterday. Owned by the Finance Ministry, Mavtrac acts as a supply chain integrator to help contractors and project developers with procurement and supply of strategic construction materials. “Mavtrac works closely with project owners to forward bundle demand, for which price economies of scale are secured and supplied to the projects utilising the existing distributor network and suppliers. “This way, Mavtrac is not displacing existing supply chain members, but integrates the supply chain for overall value (price, quality and security supply),” Azman said. Currently, most of the projects that the company were involved in were linked to the Government such as those by the Works Ministry and government-linked companies like UEM World Bhd for its Nusajaya project. “However, our plan is to expand our business involvement to other property players as we believe we can’t just rely on government-led initiatives only,” he said. He added that Mavtrac’s role was to help industry players, especially the small contractors, to access materials at fair price and to facilitate the procurement process for efficiency. “We have already developed strategic partnerships with a number of distributors, wholesalers and manufacturer, and this would make it much easier for contractors and project developers to plan for their business,” he said. Azman also said Mavtrac would continue to offer value-added services to the construction community, aided by its trading portal, www.mavtrac.com.my. Anthony Wong, owner and managing director of the Frangipani Resort and Spa Langkawi, plans to open a four-star hotel in Sabah in the near future and a third venue in Phuket, Thailand, in the long term. He is now scouting for suitable land near Kota Kinabalu to open an environmentally-friendly hotel there. As he plans to execute most of the plans by himself as well as source his own material, Wong expects that the planned 150-room hotel may cost up to RM40 million. 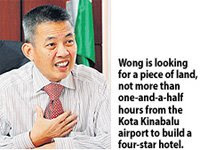 "We are looking for a piece of land, not more than one-and-a-half hours from the Kota Kinabalu airport to build our hotel," Wong told Business Times. "I have already looked at 40 sites... but we are not happy (with the sites we saw). We do not want to make a mistake when we purchase it," he added. He is looking for land measuring 4.5ha to 6ha, a third of which will be for an organic garden. "We want to grow part of the food on site and treat waste water on our own so that it does not go out into the sea and pollute it," he said. Since the hotel will be built from scratch, it will also incorporate many energy-efficient features. "We want to be able to use the heat from the air conditioners to be able to run other things. Basically, we want to be energy efficient as energy usually makes up 20 per cent to 25 per cent of operating costs," Wong said. Sunway International Hotels & Resorts Sdn Bhd, a subsidiary of Sunway City Bhd, has signed an agreement with Perfect (China) Co Ltd to manage the Golden Diamond Hotel in Zhongshan, China, under the Sunway brand. The agreement, signed in Zhongshan yesterday, marks the Sunway group's first entry into the Chinese hospitality industry. Chief executive officer Hanley Chew signed the agreement on behalf of Sunway International Hotels & Resorts, while Perfect was represented by its founder and chairman Datuk Koo Yuen Kim. Zhongshan-based Perfect is a Malaysian-owned investment company producing health, cosmetics and sanitary products. "With Sunway Hotel Golden Diamond as our first hotel in China, we have set our sights on expanding further in China, with potential hotel projects in Beijing and Anhui," Chew said in a statement yesterday. Sunway Hotel Golden Diamond offers 194 rooms and suites, 134 apartments, four function rooms and a grand ballroom. Apart from China, Sunway International Hotels & Resorts operates hotels and resorts under the Sunway and Allson brands in Malaysia as well as neighbouring countries such as Cambodia, Indonesia, Singapore and Vietnam. Malaysia Pacific Corp Bhd (MPC) has denied that it is in talks with the Qatar Investment Authority for the redevelopment of Wisma MPL in Kuala Lumpur. In a statement to Bursa Malaysia yesterday, it said that it is in negotiation with a foreign development fund comprising local and Middle Eastern parties on a 51-49 per cent joint venture, to build a proposed new 50-storey office tower on its existing plot of land at Jalan Raja Chulan, Kuala Lumpur. MPC expects the joint venture to bring immediate and long-term benefits if the deal is concluded. Conglomerate Genting Group is still on track to launch its S$6.59 billion (RM16 billion) integrated resort in Singapore by the first quarter of 2010, despite recent news of delays by rival Las Vegas Sands. "We are on track and on time for the soft launch of Resorts World at Sentosa," Genting Bhd head of strategic investments and corporate affairs Datuk Justin Leong said during the CIMA World Conference 2009. The integrated resort comprises Universal Studios, a casino and six hotels with a total of 1,830 rooms. Last week, Las Vegas Sands said the targeted launch of Marina Bay Sands by year-end was pushed back for several months due to shortage of labour and materials. Las Vegas Sands now hopes to open by January or February next year. Meanwhile, Leong did not rule out the possibility of bringing Universal Studios to Malaysia in the future, but said such plans would hinge on the success of Universal Studios in Singapore.